Your finished scarf will measure approximately 7.5″ wide and 48″ long (not including tassels). 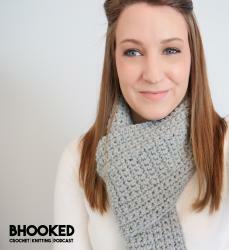 If you’re in love with hairpin lace, I have another free pattern for you to try! Crochet two standard hairpin lace strips with 375 loops on each side. Use guides or stitch markers to group loops in sets of 25. Fasten off but do not release your stitch markers or weave in your ends just yet. Place your two hairpin lace strips side-by-side. Working in sections, release one stitch marker at a time. Place 5 loops from one strip on your crochet hook. Leave them on your hook while placing 5 loops on your hook from the other strip. Pull the last five loops through the first five loops. Now continue to “braid” the two strips together, 5 loops at a time. When you reach the end, secure the “live loop” with stitch markers so the braid doesn’t come out. Row 1: Group first 3 loops, twist and fasten on new yarn. Make 3 sc in this first group of 3 loops. *Group next 3 loops and make 2 sc. Rep from * to last group of 3 loops. Make 3 sc in last group. Row 2: Ch 1 (does not count as st). Sc in first st. *Sk 1 st, ws in next st. Rep from * to last st. Sc in last st.
Row 3: Ch 1 (does not count as st). Sc in first st. *Sk 1 st, ws in next st. Rep from * to last st. Sc in last st.
Rep row 3 until your woven section measures approximately 2″. Fasten off and repeat on the other side. Use the tail directly adjacent to the “live loop” to secure the loop and lock it in place by weaving it in. Make 6 tassels that measure approximately 4″ long. Attach one tassel to each corner and one tassel at each end of the braid. Weave in your remaining ends and wet block. Hi, Brittany. I just finished the scarf. Well, almost. Just have to finish one end to match the other. This was my first Hairpin Lace project. I made the loom as wide as it goes, used an H hook and did 375 loops on each side with the Unforgettable yarn in Stained Glass. The scarf came out about 12 feet long. (My hubby just verified it.) And I made two of them! I ended up weaving the middle together, then “folded it sideways” and wove the new middle together. I have a curved top, and will try to match it with the remaining yarn at the bottom, now with 4 ends. Can’t figure out what I did wrong. Hi Nancy! Wow, I’m scratching my head a bit on this one – that is quite a bit longer than what’s measured in the pattern! Hi, Brittany, I LOVE this pattern and I’m attempting it. I bought a loom but the ends don’t clip on like the one in your video, so they supposedly slide on. I know the holes for the posts can’t be too loose but these are impossible for me to adjust as they are so very tight. Long story short, what loom did you use and from where did you purchase it? Thanks for any information you can give me!! Hey there! I am using the Boye hairpin lace loom in this tutorial. I bought it from my local Joanns! Thanks very much for the info! Wish me luck. I have about 2/3 of a hairpin strip done. I ended up getting a Boye from Herrschner’s (on line) but I’ve had a lot of trouble getting it to stay clamped. So I’ve gone back to the Susan Bates loom (better too tight than too loose). I have about 2/3 of a hairpin strip finished. Crossing my fingers!! Absolutely gorgeous. Thank you for the pattern. Doing my first hairpin lace now! Question (came up on Marly Bird’s page as well from someone who made and posted it) What is the length? 48″??? The person who made it said it more like 72″? Just wanted to check before I get to that point. Thank you again for a lovely pattern! Hi Donna! I’m scratching my head on this one. My scarf measures approximately 48″ long. Perhaps there was a difference in the number of loops that person crocheted? Do you make this to sell? If so, how much? I don’t crochet but this is stunning! Hi Marsha! Thank you so much for your inquiry. Unfortunately, I do not contract my work – I like to focus on my passion of teaching 🙂 There are many talented makers in this community. Perhaps someone reading this comment can get in touch with you! This was so easy to follow. thanks. any thoughts as to why my scarf ended up 72 inches long? It was the correct width. I used the same yarn and hook sizes and the same loom. thanks for any input. Hi Kathy! I’m scratching my head on this one!